اسمعیلی مقدم, سعید, جعفری صمیمی, مجتبی, سیدزاده اطاقسرائی, سید مجتبی, رضوی, محمد, سیدزاده اطاقسرائی, سید رضا. (1396). ساخت بتن سبک و مقاوم با استفاده از ذرات چوب و سیلیس. مجله صنایع چوب و کاغذ ایران, 8(4), 585-603. سعید اسمعیلی مقدم; مجتبی جعفری صمیمی; سید مجتبی سیدزاده اطاقسرائی; محمد رضوی; سید رضا سیدزاده اطاقسرائی. "ساخت بتن سبک و مقاوم با استفاده از ذرات چوب و سیلیس". مجله صنایع چوب و کاغذ ایران, 8, 4, 1396, 585-603. اسمعیلی مقدم, سعید, جعفری صمیمی, مجتبی, سیدزاده اطاقسرائی, سید مجتبی, رضوی, محمد, سیدزاده اطاقسرائی, سید رضا. (1396). 'ساخت بتن سبک و مقاوم با استفاده از ذرات چوب و سیلیس', مجله صنایع چوب و کاغذ ایران, 8(4), pp. 585-603. اسمعیلی مقدم, سعید, جعفری صمیمی, مجتبی, سیدزاده اطاقسرائی, سید مجتبی, رضوی, محمد, سیدزاده اطاقسرائی, سید رضا. ساخت بتن سبک و مقاوم با استفاده از ذرات چوب و سیلیس. مجله صنایع چوب و کاغذ ایران, 1396; 8(4): 585-603. 1دانشجوی دکتری فرآورده‌های چندسازه چوب، دانشکده منابع طبیعی، دانشگاه تهران، کرج ایران. این تحقیق با هدف بررسی امکان ساخت بتن سبک و مقاوم و تاثیر درصدهای مختلف ذرات چوب و سیلیس بر خواص فیزیکی، مکانیکی و ریخت‌شناسی آن‌ها انجام شد. ذرات چوب به صورت دانه‌بندی و در 5 سطح صفر، 5، 10، 15 و 20 درصد و ذرات سیلیس در مقیاس نانومتری و میکرومتری در 4 سطح صفر، 3، 6 و 9 درصد بر مبنای وزن خشک سیمان متغیرهای این تحقیق بودند. فرآیند اختلاط مواد به صورت دستی انجام شد و خمیر سیمان تولید شده به درون قالب‌های مکعبی شکل با اضلاع 5 سانتی‌متر ریخته شد. جهت متراکم کردن ژل سیمان از میز ویبره استفاده شد. بعد از ساخت بتن‌ها خواص فیزیکی شامل جذب آب، ضریب انتشار رطوبت و دانسیته مطابق با استاندارد ASTM و خواص مکانیکی شامل مقاومت فشاری و شاخص مقاومت فشاری مطابق با آیین‌نامه بتن ایران (آبا) انجام شد. طیف‌سنجی مادون قرمز جهت بررسی تاثیر ذرات سیلیس بر بتن‌های ساخته شده انجام شد. میکروسکوپ الکترونی پویشی جهت مطالعه رفتار ریخت‌شناسی بتن‌ها مورد استفاده قرار گرفت. نتایج نشان داد که با افزایش چوب، دانسیته، مقاومت فشاری و شاخص مقاومت فشاری کاهش یافت در حالی که جذب آب و ضریب انتشار رطوبت نمونه‌ها افزایش یافت. با افزایش سیلیس تا 3 درصد، مقاومت فشاری و شاخص مقاومت فشاری افزایش یافت و افزودن مقادیر بیشتر سیلیس تاثیر منفی بر روی این خواص داشت. جذب آب نمونه‌ها با افزودن سیلیس تا 3 درصد کاهش و پس از آن افزایش یافت. دانسیته نمونه‌ها با افزایش سیلیس افزایش یافت. با افزایش سیلیس تا 3 درصد ضریب انتشار رطوبت کاهش یافت اما پس از آن و با افزایش بیشتر سیلیس ضریب انتشار رطوبت افزایش یافت. طیف‌سنجی مادون قرمز نشان داد که در اثر افزودن سیلیس پیک مربوط به گروه هیدروکسیل کاهش یافت. نتایج میکروسکوپ الکترونی پویشی حاکی از پراکنش مناسب ذرات سیلیس در سطح 3 درصد بود. Naseri, H., Afshin, H. and Tufani milani, A., 2014. Investigation into mechanical properties of fibers reinforced lightweight concrete precast panels. Concrete research journal, 7 (2): 7-15. Rahmanpour, M. and Afshin, H., 2016. The combined retrofitting of reinforced light structural concrete beams in near joint by using of steel plates and CFRP jacket under cycling loads. Concrete research journal, 9 (1): 71-82. Golbabaei, F., 2015. Investigation on cement brick production containing wood sawdust. Iranian journal of wood and paper science research, 30 (3): 457-465. (In Persian). Sadr Momtazi, A., Kohani Khoshkbijari, R. and Lotfi Omran. O., 2015. Mechanical and durability properties of self-compacting concrete containing nano silica particles considering optimum percentages of fibers. Concrete research journal, 8 (2): 19-34. Tabei, A., Jamalzadeh, M. and Pourimanparast, M.M., 2011. An investigation of some physical and mechanical properties of the wood-cement made of poplar sawdust and portland cement mix. Journal of renewable natural resources research, 2 (4): 39-54. Younesi-Kordkheili, H., Naghdi, R. and Honarbakhsh Raouf, A., 2016. Investigation on some of physical and mechanical properties off polypropylene fiber/wood/cement composites. Iranian journal of wood and paper industries, 7 (2): 207-217. (In Persian). Nasiri, H., Varshoee, A. and Kargarfard, A., 2011. Investigation on the properties of cement-bagasse fiber composite as a structural material. Iranian journal of wood and paper science research, 26 (2): 291-299. (In Persian). Mohammadkazemi, F., Dousthoseyni, K., Enayati, A.A. and Azadfallah, M., 2013. Effect of nano silica and Type of lignocellulosic material on physical and mechanical properties of wood-cement panels. Journal of forestry and wood products, 66 (2): 193-201. (In Persian). Abdolali Sarbandi, M., Bolhasani, M., Bilba, K. and Ashjary, R., 2010. Investigation of the effect nano silica and eucalyptus fiber on MOR of fiber-cement composite products. International congress of wood and paper industries, Chalous, p. 103. Standard Test Methods for Sampling and Testing Brick and Structural Clay Tile, Book of Standards Volume: 04.05. Arisoy, B. and Wu, H.C., 2008. performance of a fiber reinforced lightweight concrete panel. Institution of civil engineering, 2 (1): 157–162. Han, G., Lei, Y., Wu, Q., Kojima, Y. and Suzuki, S., 2008. Bamboo–fiber filled high density polyethylene composites; effect of coupling treatment and nano clay. Journal of polymer environment, 21 (2): 1567-1582. Wei, Y.M. and Tomita, B., 2001. Effects of five additive materials on mechanical and dimensional properties of wood cement-bonded boards. Wood science, 47 (1): 437-444. Ismaeilimoghadam, S., Masoudifar, M., Nosrati, B. and Shamsian, M., 2016. Effect of inorganic nanoparticles on mechanical and morphological properties of wood flour-polypropylene nano composit. Drewno, 59 (196): 127-137. Li, H., Xiao, H.G., Yuan, J. and Ou, J., 2005. Micro structure of cement mortar with nano-particle. Composites: Part B, 35 (1): 185-189. Ji, T., 2005. Preliminary study on the water permeability and microstructure of concrete incorporating nano-SiO2. Cement and concrete research, 35 (1): 1943-1947. Li, G. and Zhao, X., 2003. Properties of concrete incorporating fly ash and ground granulated blast-furnace silage. Cement and concrete composites, 25 (2): 293-299. Bahadori, H. and Hosseini, P., 2012. Reduction of cement consumption by the aid of silica nano-particles (investigation on concrete properties). Journal of civil eng manage, 18 (3): 416- 425. Gong, H.Y., Zhang, Y.J., Quan, J. and Che, S.W., 1993. Preparation and properties of cement based piezoelectric composites modified by CNTs. Current Applied Physics, 11 (1): 653-656. Younesi Kordkheili, H., Farsi, M. and Rezazadeh, Z., 2013. Physical, mechanical and morphological properties of polymer composites manufactured from carbon nanotubes and wood flour. Composites part B, 44 (1): 750-755. Enayati., A.A. 2009., Wood physics, 317p. (In Persian). Kord, B., Taghizadeh Haratbar, D., Malekian, B. and Ismaeilimoghadam, S., 2016. Effect of chemical modification of wood flour on long-term hygroscopic behavior of polypropylene composites. Journal of thermoplastic composite materials, 29 (4): 577–588. Md Akil, H., Cheng, L.W., Mohd Ishak, Z.A., Abu Bakar, A. and Abd Rahman, M.A., 2009. Water absorption study on pultruded jute fibre reinforced unsaturated polyester composites. Composite science and technology, 69 (11–12):1942–1948. Dhakal, H., Zhang, Z. and Richardson, M., 2007. Effect of water absorption on the mechanical properties of hemp fibre reinforced unsaturated polyester composites. Composite science and technology, 67 (7–8): 1674–1683. Quercia, G., Spiesz, P., Husken, G. and Brouwers, J., 2012. Effects of Amorphous Nano silica addition on mechanical and durability performance of scc mixture. International congress on durability of concrete, 8-12. Roohani, M., Kord, B., Motie, N. and Sharari, M., 2014. Biiodegradattiion behaviiors off cellllullose nanocrysttalls --PVA nanocomposiittes. 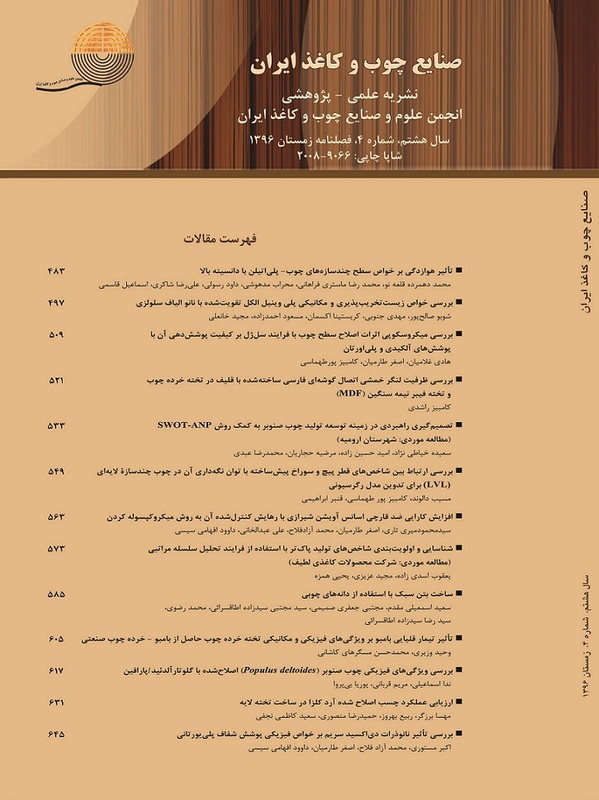 Iranian journal of wood and paper industries, 5 (2): 1-13. (In Persian). Roohani, M., Habibi,Y., Belgacem, N.M., Ebrahim, G., Karimi, A.N. and Dufresne, A., 2008. Cellulose whiskers reinforced polyvinyl alcohol copolymers nanocomposites. European polymer journal, 44 (8):2489–2498. Kord, B., Jari, E., Najafi, A. and Tazakorrezaie, V., 2014. Effect of nano clay on the decay resistance and physico-mechanical properties of natural fiber reinforced plastic composites against white-rot fungi (Trametes Versicolor). Journal of thermoplastic composite materials, DOI: 0892705714563343. Kamyab, M. and Nazerian, M., 2016. Effect of lignocellolosic materials on hydration process and mechanical properties of particle board-chalk. Journal of forestry and wood products, 69 (2): 419-432. Najafi, A. and Khademi-Eslam, H., 2011, Lignocellulosic filler/recycled HDPE composites: effect of filler type on physical and flexural properties. Bioresources, 6 (3):2411-2424. Kazemi, S., Kiaeifar, A., Tajvidi, M. and Hamidinia, E., 2007. Water absorption behavior and thickness swelling rate of composites from sawdust and recycled plastics. Journal of reinforced plastic and composites, 26 (3): 341-348.